Here is a practical kit that will allow you to handle most common cutting jobs. This Value Kit combination is grouped in proportions recommended by our contractor clients. This kit is highly recommended for professional handymen. Our Quick Release Universal Bi-Metal Blades are designed for Flush or Plunge cutting situations. 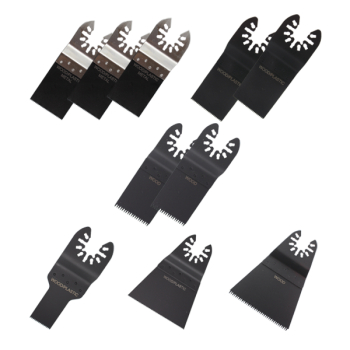 These blades are ideal for remodeling jobs requiring general cutting of nail embedded wood. This demolition blade is also great for cutting fiberglass, PVC, copper pipes, metal mesh and thin sheet metal. Use this high carbon steel Quick Release blade for clean flush cutting into hardwoods, plywood and particle boards. The fine teeth on this blade make it excellent for controlled cutting of plastics, sheetrock, fiberglass and other non metallic materials. This Quick Release blade has a precision ground double-row of beveled teeth which allow for aggressive plunge cutting into wood, sheetrock and soft plastics. Use this Japanese style blade to achieve high speed cuts. This aggressive blade will have you approaching reciprocating saw cutting speeds. The precision Japan teeth also cut through laminates without chipping and the tooth design (kerf) resists saw dust loading saving your motor from work overloads. Great for plunge cutting into softwoods at maximum drive speeds and if you have a steady hand your cuts will have nice clean finish. This 2-5/8" wide Quick Release blade is designed for clean flush cutting into hardwoods, plywood and particle boards. This fine tooth blade is excellent for controlled cutting applications of plastics, sheetrock, fiberglass and other non metallic materials. An excellent choice for large area cutting such as flooring or wall panels. The larger surface of this cutter makes it an excellent "shovel blade" for lifting old flooring coverings with ease. The 2-5/8 precision ground double-row beveled tooth design allows for wide scale aggressive cutting into wood, sheetrock and soft plastics. Use this Japanese style blade to achieve high speed cuts. This wide aggressive blade will have you approaching reciprocating saw cutting speeds. Use this Quick Release blade for large area cutting such as flooring or wall panels. These precision Japan teeth cut through laminates without chipping and the tooth kerf design resists saw dust clogging saving your motor from expending precious energy fighting saw dust overloads. This blade is great for linear cutting of softwoods at maximum drive speeds and if you have a steady hand you will love the clean finish you get with this blade.